Do you ever say “no” or think “no” to something just because it wasn’t in the plan, or it might be messy, or it just feels like trouble? I almost said “no” to a pomegranate in the grocery store on Wednesday afternoon. 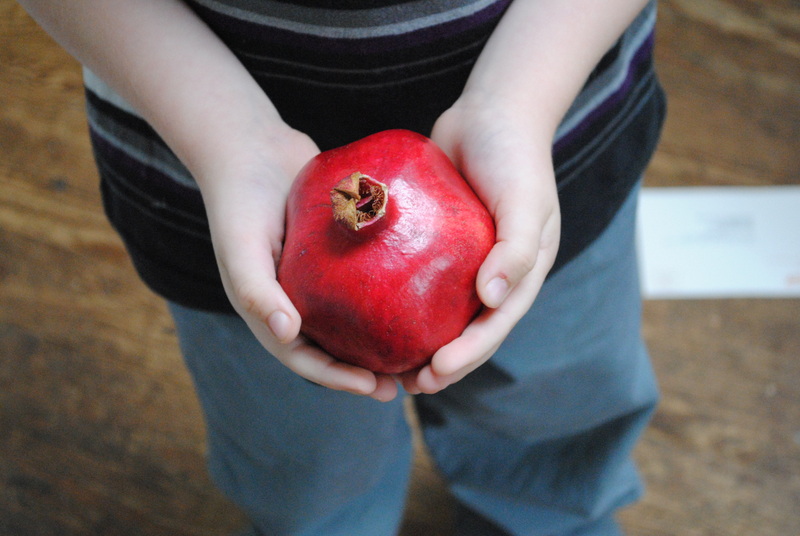 My boy–a curious, inquisitive little munchkin–was immediately captivated by this reddish, purplish gem. He held it, sniffed it, hugged it (yes! ), examined its odd “stem” (that’s not where it really connects to the plant), and emphatically explained–despite my protests–that in “Bible times,” people could just bite into this fruit. See, our storybook Bible shows a pomegranate instead of the traditional apple in the Adam & Eve account. That was evidence enough that this was the fruit from the Garden. So despite my desire to hurry through the store to get home (who was I kidding? ), I agreed to purchase the mysterious pomegranate. I told my boy that we would have to Google pomegranate to be sure that we were eating the right parts. He exclaimed, “We’re going to be scientists!” So as culinary scientists, we proceeded to read up on our specimen and prepared to dissect. I was immediate reminded of the myth concerning the pomegranate and the droplets of “blood” inside. I’ll have to look that up again. Truly, the fruit was beautiful, but how odd that the seeds are the only edible part. We had such fun investigating and playing scientist. For $1.38, we had a productive afternoon of exploration. I’m so glad that I didn’t say the “no” out loud. Love this! Don’t you just love those learning experiences! I loved having these type of things in the house. So much better than the heat coming through the window. “Love” is a good word to get stuck on. Thanks for stopping by. Thanks, Rebecca, coming over to Warm As Pie. It’s a tough balance, but once in awhile, a mess is good fun! I love pomegranates! I used to eat these as a kid in the summer. They were so messy and I had to make sure not to get the juice on my clothes, but I loved them. Thanks for saying yes and for sharing your adventure. It sure brought back wonderful memories for me.